The piano in the common area of Ostello Bello, Lake Como. After staying at Ostello Bello (translation: Hostel Beautiful) in Lake Como, Italy, we can surely say our standards for hostels have been raised many notches. Ostello Bello has six hostels worldwide: three in Italy (two in Milan, one in Como), and three in Myanmar. The "poshtels" have been featured in many publications, including The Guardian and CNN, because of their attention to detail and some amenities that rival (or even outdo!) that of a 5-star hotel. The kitchen in Ostello Bello Hostel in Lake Como is constantly stocked with snacks galore. Not only do they serve complimentary breakfast, as many hostels do, but a buffet-style dinner (which they call “aperitivo”) as well, something I have yet to see at any other hostel, or even most hotels. There’s even 24hr free coffee and tea and endless snacks to grab. Now that is what we call Italian hospitality. Buon Appetito! We were very impressed by the modern, sleek design of the hostel common areas. So many cute details, including hammocks in the "secret garden" and mailboxes to send postcards to your friends, write to the lover you met last night, or leave feedback about your experience at Ostello Bello. The common room has guitars and a piano for a jam session with new friends, a huge flatscreen TV, plenty of books and of course, cozy furniture. 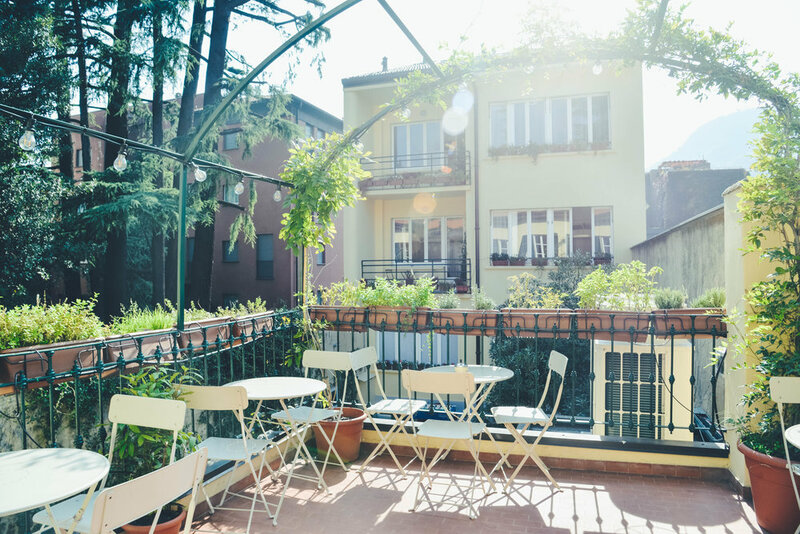 There are also multiple outdoor garden areas and a terrace to soak up the Italian sunshine. Hammocks in Ostello Bello Lake Como's Secret Garden. Sleek, new furniture and beds with USB plugs: just a couple of ways Ostello Bello steps their game up. Whether you are staying dormitory-style or in a private room, you will surely be comfortable in Ostello Bello. We aren’t typically fans of dormitory-style accommodation, with some hostels giving us nightmares from the cramped, smelly rooms. We did stay dormitory-style (6-bedroom mixed dorm) at Ostello Bello and we were pleasantly surprised with our experience! The rooms are bright and spacious, with new beds and big lockers to place your belongings in. Next to each bed is a USB charging port for your phone, and every room has an en-suite bathroom - and even a hairdryer, which we sometimes don't even see in 3-star+ hotels in Europe. A hairdryer in your en-suite hostel bathroom? It's the little things, people! Some happenings in Ostello Bello: a 24hr bar (open to locals til 1am or later) and the secret garden! Another great thing about Ostello Bello Lake Como is that it is not just a hostel, but a local hangout as well, with the bar/cafe open to locals until 1am and open 24 hours for hostel guests! This gave us the ability to mingle with the locals and learn more about the flavor of the town instead of just meeting other guests. There was an open-mic night during our stay, where locals showcased their talents, and I even got an impromptu Italian lesson by an Italian (and learned my Italian is not very good). Those staying at Ostello Bello in Lake Como can enjoy being right next to one of the most beautiful lakes (and towns, Como!) in Italy. One can easily take a bus to Bellagio and enjoy the many lovely villas. Or, perhaps one prefers to rent a motorboat from AC Boat Rental - no license required - and take it for a spin to view the surrounding towns on Lake Como, including Bellagio, Menaggio, and Lenno. Beautiful sunset on Lake Como. Stunning Lake Como views are just one reason why Ostello Bello, Lake Como is awesome! In short, Ostello Bello Lake Como finally restored our faith in hostel living, and we highly recommend you stay with them next time you visit Lake Como, Milan, or Myanmar. Thank you, Ostello Bello famiglia, for hosting us in your lovely accommodations! We were not paid to write this review, and all opinions expressed herein are our own. Want even more tips to travel like a pro? Subscribe to our newsletter and follow @theupbeatpath on Twitter, Facebook and Instagram for more.